Dennis Tito became the first space tourist when he launched toward the International Space Station in April 2001. Here, he shares his experiences at a space conference in 2003. Update: Tito announced that his Inspiration Mars Foundation is seeking a married male-female couple to journey on a Mars flyby mission in 2018. For more details, see our full story here. A millionaire space tourist plans to make a major announcement today (Feb. 27) about launching a trip to Mars in 2018. 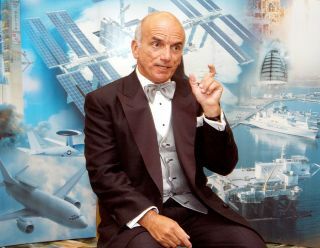 American businessman Dennis Tito paid about $20 million to visit the International Space Station in 2001 aboard a Russian spacecraft. Now, Tito is launching a new nonprofit organization called the Inspiration Mars Foundation to plan another private trip to space. Details about the private Mars voyage, including whether it will be manned or robotic, are set to be revealed during a press conference today at Washington, D.C.'s National Press Club. Speakers at the 1 p.m. EST (1800 GMT) event will include Tito, as well as longtime space journalist Miles O’Brien, former NASA flight surgeon Jonathan Clark, a professor of space medicine at Baylor College of Medicine, Taber MacCallum, chief executive officer and chief technology officer of Paragon Space Development Corporation, and Jane Poynter, Paragon's president and chairwoman. The Inspiration Mars Foundation plans to mount a mission to "take advantage of a unique window of opportunity to launch an historic journey to Mars and back in 501 days," project officials wrote in a media advisory. "This 'Mission for America' will generate new knowledge, experience and momentum for the next great era of space exploration. It is intended to encourage all Americans to believe again, in doing the hard things that make our nation great, while inspiring youth through Science, Technology, Engineering and Mathematics (STEM) education and motivation," they added. No private company has yet launched people to space on commercially built vehicles, though numerous firms, such as Space Exploration Technologies Corp., are working toward that goal. NASA itself is also pursuing the goal of sending humans to Mars. The space agency is developing a new capsule called Orion, and a new heavy-lift rocket called the Space Launch System (SLS), to take astronauts beyond low-Earth orbit and to new destinations in the solar system, including asteroids and the Red Planet. To watch Tito's announcement live at 1 p.m. EST (1800 GMT), visit: http://www.inspirationmars.org/.